We vegan cooks like to pride ourselves on how creative it is to be a vegan in the kitchen, recreating traditional standard meals with healthier ingredients. We love to get things to look like “the real thing” too. Some of my favorite treatments of this kind in the vegan blogging world are things like vegan spaghettios or vegan cheerios or even vegan twinkies. Just funny and fun. And then of course there is vegan “roast” made out of wheat, vegan “bacon” made out of eggplants, and of course vegan burgers made from beans.You name it. We’ve got the creativity corner covered. Or so we assume. But apparently the Italians have been way ahead of us, with a Christmas treat that’s a play on the cold cut salami. Known on the internet as chocolate salami or dessert salami (I hear the Portuguese make one too), it’s a no bake dessert packed with melted chocolate, sugar, butter, broken cookies and nuts that gets formed into a log, chilled and sliced like, well, a salami. Ingenious. And decadent Christmas fun. Here’s a pretty one featured on someone writing a blog for NPR, here’s one in Italian with the English carelessly dubbed in, and here’s two funny British guys making their version. Curious, I googled to see if there were any vegan remakes of chocolate salami and I found a couple. 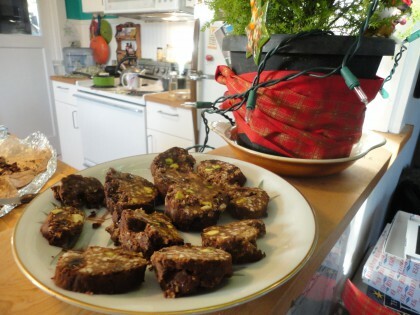 But one was packed with coconut oil and way too many nuts for me, and in the other the base was mostly pureed dried fruit and melted chocolate–not something that supports my Happy Tooth scenario in that large of an amount. And as far as I know, of course, no one has come up with a carob salami, so the way is clear for me to break some new ground. I hope the ingredients in this dessert salami will surprise and delight your taste buds as much as they do mine. Not wanting to fill a whole log with cookies, I turned to cooked millet as a base. It’s slightly sweet like the anisette biscotti used in the original, it clumps like crazy when cooked, and I know from my pie and fudge experiments carob powder tastes great with it. 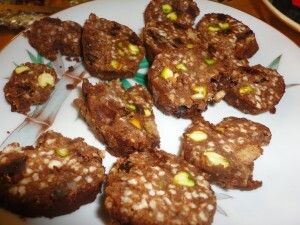 I also wanted the sweet things and the nuts I used to stand out both visually and in terms of taste. Just like an art project, I got to think about juxtaposition of texture, color and overall design that would appear when I sliced the “salami.” The entire experience was a visual and textural and taste-test adventure. Which brings me to an advance apology about measurements. As I often say, these are approximate, because the truth is, I add and taste as I go. And the other confession I have to make is that I cook like an old-fashioned quilter. I use bits and scraps of what I have left over and need to be used up, or bits put into the freezer for when the time is right. The batter for this dessert salami is made from such odds and ends into a tasty pattern of special seasonal delight. I do uss some nuts and nut butter so they are not fat free, but they certainly are far lower in fat than their other vegan counterparts. And as the links above demonstrate, they can be made with cocoa powder or melted vegan chocolate too. You might need more sweetener if you make them with cocoa powder. Let me know. measurements are approximate. Use your inner peasant woman’s judgement to assess taste and texture. Combine all the ingredients in a bowl and mix into a dough that you can shape. Tear off a piece of wax paper and sprinkle it with a mixture of carob powder and cinnamon. Place the dough on the carob-cinnamon mixture and shape into a log with your hands. Roll it up in the wax paper and shaped it a little more if needed. Then roll that up in some aluminum foil and seal the ends. Place in the freezer overnight. In the morning, take it out, unroll it from the wax paper and slice carefully with a serrated knife. Enjoy. To store the slices, refrigerate in a container. Stack the layers with pieces of baking parchment in between each layer of slice. The slices will soften a bit, but hold their shape. I imagine they are a little more fragile than those made with melted chocolate and butter because they are much lower in saturated fat. Notes: When I made this dessert salami the first time, I impulsively added the tablespoon of raisins at the end to get another texture, color and taste. They were just right for that, but they did not slice well. If you use raisins that are not super soft, plump them up for a few minutes first is some hot water from the tea kettle. If you haven’t got any leftover Double Banana Bread in the freezer like I had, you can try crumbling up any of my other cookie recipes like Ginger Snaps or oatmeal cookies or just use rolled oats or soaked oat groats or even soaked and toasted buckwheat groats. I think a version with oats and peppermint extract would be pretty tasty. 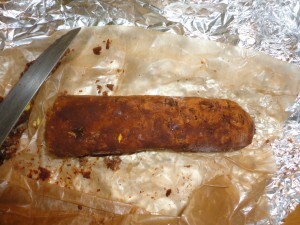 I took the slices from the second batch of this dessert salami I made to poetry nigh. I brought it, along with my ginger snaps and some hummus and cucumber slices so I would have something to eat. I didn’t expect that anyone would be very interested. I was packing up to leave during a “snack break” and as I picked up my treat dish one woman said–“Oh wait, what are those little fruit cake looking slices? They are really good!” She took a couple more to put on her plate. And then someone else wanted to try them before I packed up the plate. And someone else. They all liked the “salami.” And so did another friend who came over the day I made the first batch. I’m grateful toyet another friend of mine who shared her enthusiasm for the conventional version of this dessert on facebook. Otherwise I wouldn’t have known it exists. But once I did, it was impossible to resist the urge to see what I could come up with. I never seem to be able to pass up an opportunity to play with my food. So if you want to leave Santa Claus a treat, maybe you can try to fake him (or her) out with this ingenious dessert salami. I was so delighted to see your post about your carob pistachio “salami”. I am giving as presents to many friends this Christmas the yummy Salame di Fichi that I discovered during the year. Made by local fig growers with almonds or walnuts these fig salamis are vegan etc enough for me to be able to indulge in a wafer-thin slice every now and then. Being partly of Hungarian stock I was attracted to these fruity salamis! I would love to be able to make your creative versions one day (when I’m better!). Many thanks for your delightful, amusing and creative writing – and artwork – throughout the year, not to mention your delicious and healthy recipes! I wish you a blessed Christmas and another year of ‘miracles’. Thanks Pam! Yes once you have a ready supply of carob (and millet LOL) you can go to town when you are settled back in. For now, though, thanks for encouraging me on! That is such a clever adaptation! I’ve never had the original version, but the vegan kind sounds way better anyway. 🙂 It’s almost like taking slices of cookie dough… Yum!